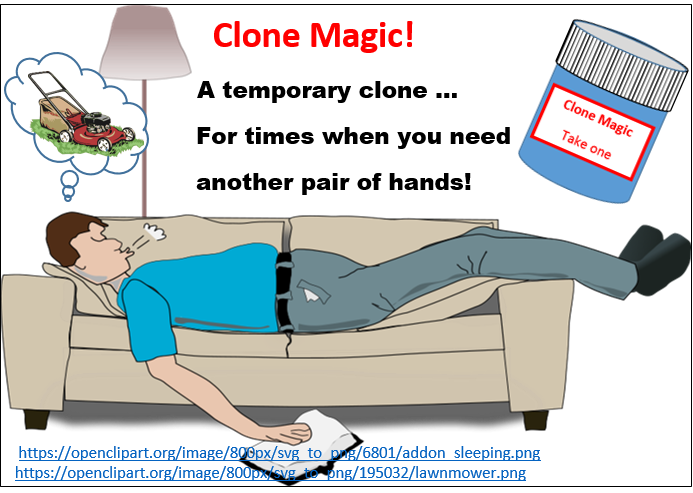 clone yourself to ensure you get everything done? slow time down so that you could achieve all you wanted? make time stand still so you could stay in the present moment forever? pop back in time to undo that embarrassing moment, or peek forward to see the result of a decision that is pending? choose both options and follow each through consecutively, as in parallel universes? Multiple invitations or engagements often occur on the same date. Deciding between desired activities is not always easy. Cloning would make choosing unnecessary. Additionally, sending a clone to an unpleasant but unavoidable engagement could also be desirable. Sometimes the number of must-do tasks can be overwhelming. The ability to engage the assistance of clones, especially to complete less desirable tasks would be great. Time travel, wormholes and parallel universes are the stuff of science fiction; and while I am not a fan of the science fiction genre, I wouldn’t mind having access to some of its features. However, whether any, or which, of those features ever move from science fiction to science fact remains to be seen. The power of imagination to drive creativity and innovation cannot be overstated. Much of what we now accept as commonplace was once a part of science fiction. Imagination, the stuff of science fiction and scientific exploration and investigation, has brought them to reality. These words highlight the importance of questioning to stimulate imagination, and when paired with creative thinking, innovation can occur. Although I cannot be certain, from those quotes, what Einstein’s attitude to the current trends in schooling would be (he did attend school and was very advanced in maths and sciences but did not perform so well in the humanities) I think he would not favour a content-driven curriculum which excluded opportunities for imagination and creativity. If these significant thinkers of the 20th century, each of whom followed different educational pathways, recognise the importance of imagination, why would anyone argue against it? Now the term ‘multiverse’ takes me back to the science fiction genre: wormholes, parallel universes and time travel, for example. I’m not sure how well I’ll do with this unfamiliar genre, but I will call upon my imagination and give it a try. 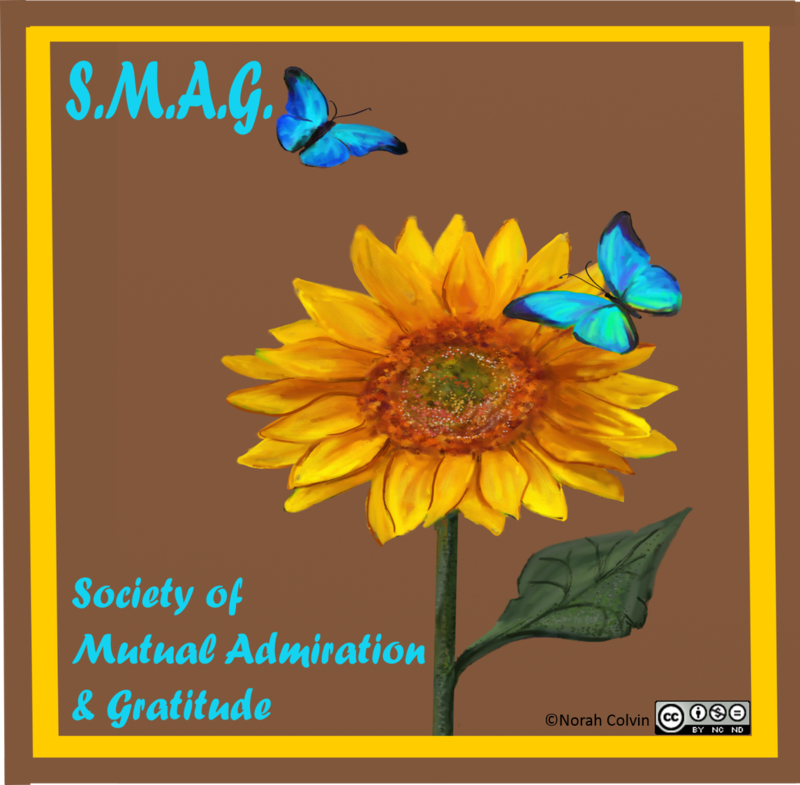 See what you think – does my piece fit the criteria? All night Leone had huddled in line, sleepless with excitement, waiting for the release. Now she had them! Clone pills! But — their hands grabbed for her book, pulling her hair and clawing her eyes. Thanks for reading. I appreciate your feedback. Please share your thoughts about any aspect of this article or my multiverse flash. This entry was posted in Alternative / non-traditional education, Blogging, Creativity, Education, Flash fiction, Quotes, Traditional schooling, Writing and tagged Children, creative, creativity, critical thinking, Curiosity, early childhood, education, Flash fiction, home education, imagination, learning, Questions, School, thinking, thoughts and ideas, Writing on August 12, 2014 by Norah. Like every other teacher, I want to make a difference in the world. The thought that I could make a positive difference to the life of another is both empowering and inspiring. To do so, I seek out others making a positive difference and pay it forward, hoping that the ripple effect will carry it far and wide. Brian is an amazing literacy educator from whom I had the extreme good fortune of learning many years ago. I have written about him before here and here. Brian’s work focused on the conditions necessary for literacy development. His influence has spread beyond the classroom with the application of the conditions to learning in the workforce demonstrated. Tony is an amazing educator who does his best to be the change he wants to see in the world. He talks about future-proofing and using innovative thinking to solve problems of both local and global importance. Anyone who believes ‘that education is the most important profession on the planet’ and does everything in his power to support teachers to be outstanding, as does Tony; must be pretty good in my books. This year Tony has started a new project called The Earth Movers Foundation which ‘helps young teenagers to create solutions to local and global issues. And they get to choose their own project. No adults will be telling them what project to do. They decide for themselves.’ Sounds pretty good to me. Ken is another amazing educator. I fell in love with his ideas when I listened to his TED talk Do schools kill creativity? which I have also shared before here. “Imagination is the source of all human achievement”. I could not argue with that. Ken introduces this short video The writing spirit which presents quotes from artists, thinkers, writers, innovators and snippets of interviews with writers. Just incidentally, and exciting for me, Richard Bach is included. Richard is the author of Jonathan Livingston Seagull, one of my favourite books for its inspirational message. It is more than likely that these educators have no idea how they have influenced my life (and others as a result). How wonderful might it be to know of the positive influence you have had on someone, and to have the opportunity of letting others know that they have positively impacted your life? 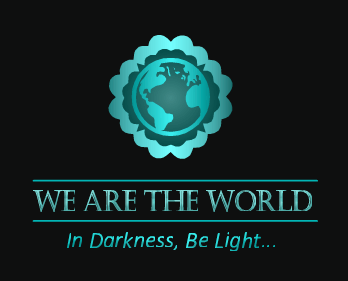 This is the purpose of The Butterfly Light Award which was bestowed upon me my Lisa Reiter, a lovely lady who is herself inspirational for her courage and her positive attitude which she shares with others through her blog Sharing the story. Thank you, Lisa. I am honoured and accept with pleasure. You should write an acceptance post, making sure you link back to the blogger who awarded you and thank them. You MAY NOT lump this award in with a batch of other awards. You must individually name and re-award to a minimum of 1 and a maximum of 9999999 bloggers. 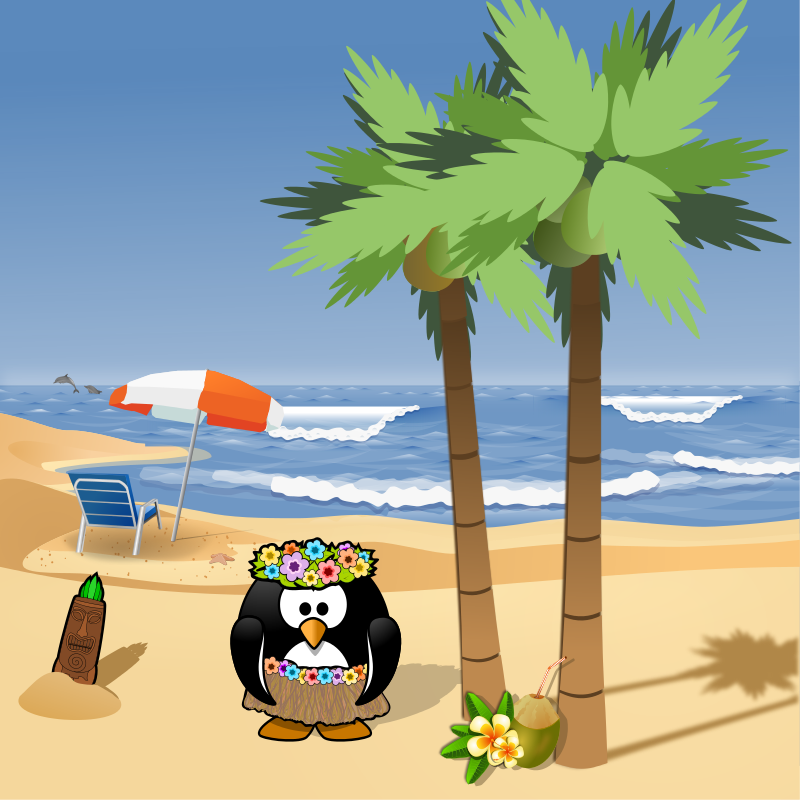 You must let them know either personally with a comment on their blog OR a pingback. As I have been writing about educators, I am going to stick with that theme. 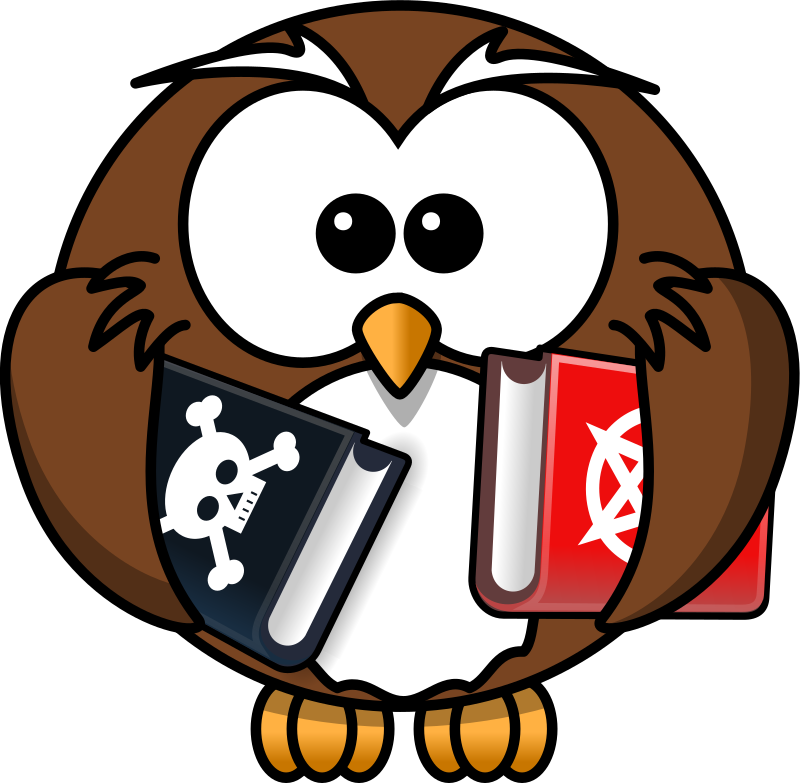 A quick visit to these blogs will explain why I have selected them. You must write a short paragraph entitled either “How I’m Spreading Light” OR “How I’m A Positive Influence” (what Lisa calls ‘the squirmy bit’). Done! See beginning of article. Thank you, Belinda. It’s a pleasure! We can never have too many butterflies! Note: The beautiful framed quote, pictured at the top of this post, was made for me by a wonderful lady, the mother of two of my students. They all share my love of butterflies! I thank them for sharing their appreciation of my positive influence. I welcome your feedback. Please share your thoughts about any aspect of the article. This entry was posted in Alternative / non-traditional education, Blogging, Creativity, Early childhood education, Education, Literacy education, Quotes, Self esteem, Traditional schooling, Writing and tagged Affirmations, Brian Cambourne, Butterfly light award, creativity, critical thinking, Curiosity, early childhood, education, home education, Ken Robinson, learning, Literacy, positive influence, ripple effect, School, schooling, teacher effect, TED talks, thinking, thoughts and ideas, Tony Ryan on June 25, 2014 by Norah. 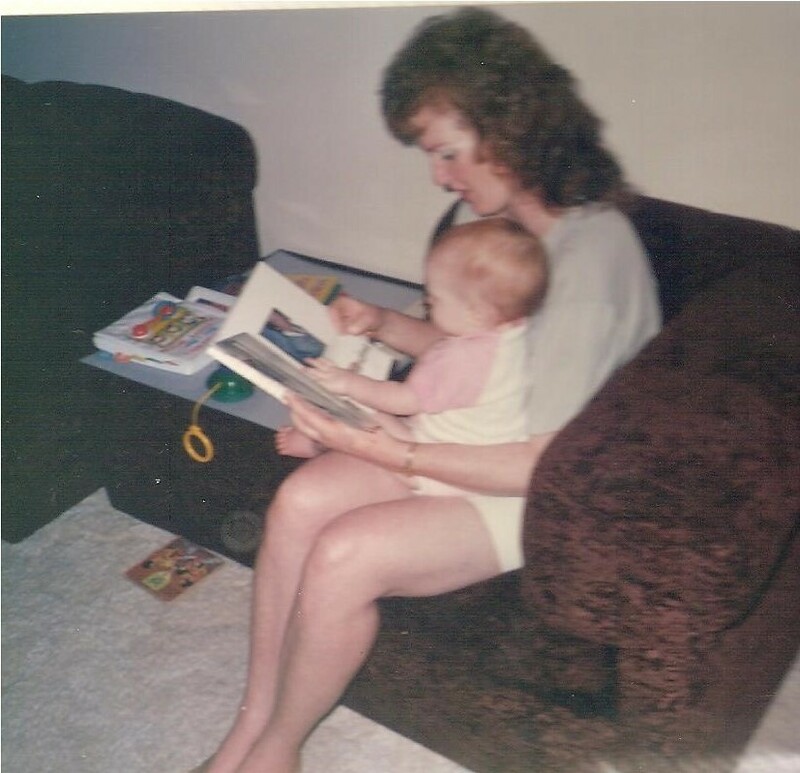 Children can be read to from the moment they are born, if not earlier. Preferably earlier! 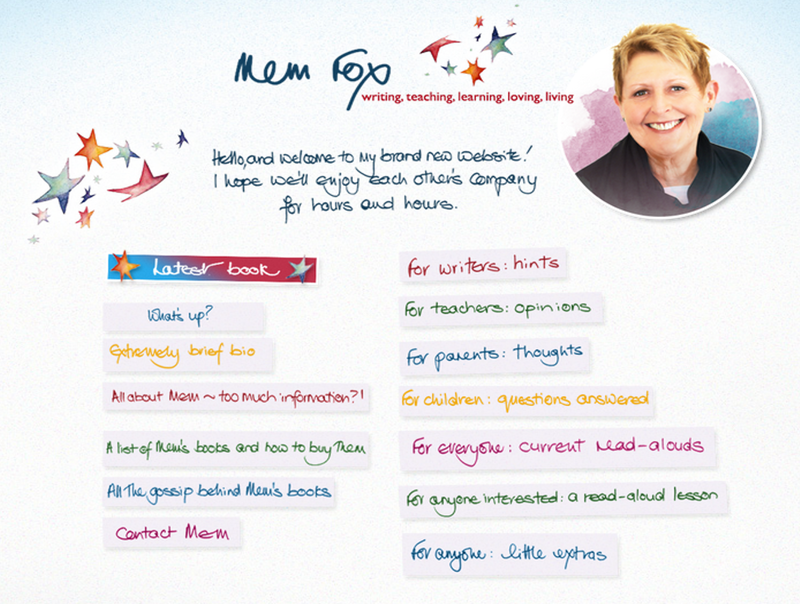 One of my favourite picture book authors and passionate advocate for reading to children is Mem Fox. I own, and have given as gifts, many of her wonderful books. I have attended her seminars and been mesmerised by her reading from her selection of stories. “Read more!” the adults beg. There are no children at these literacy seminars. This time it is a treat for only us: parents and teachers, literacy educators all. Currently Prince William, Kate and baby Prince George are visiting Australia. I was delighted to hear that they were given a gift of books by Australian authors, including some by Mem Fox. Over the years I have given many of Mem’s books as gifts; and kept just as many for myself! 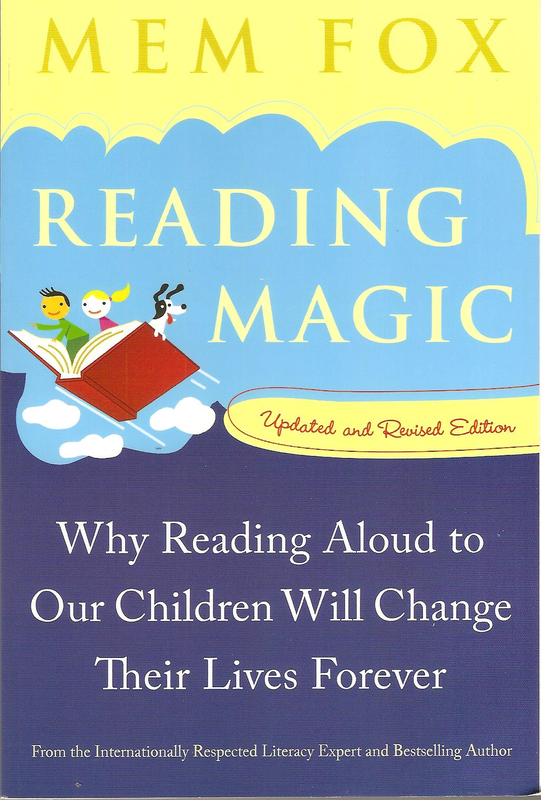 One that I have given to many new or expectant parents, as I consider it a “must read”, is Mem’s book “Reading Magic – Why Reading Aloud to Our Children Will Change Their Lives Forever”. I would love to quote the entire book for you, but it is better you read it for yourself. I will provide you with this quote from the foreword as a taster for the richness to be found inside. Mem’s website, too, is a treasure trove just waiting to be explored by writers, teachers, parents, children and children-at-heart. You can listen to Mem read from her selection of books on the Current Read Aloud page. She reads three different books each month. Currently the books are Possum Magic, Harriet, You’ll Drive Me Wild! and Goodnight, Sleep Tight. Be quick to listen to these, though, as they will change at the end of the month. But never mind, there’ll be another three to enjoy next month! What are your favourite read-aloud books? What did you enjoy as a child? What do you enjoy now? This entry was posted in Affirmations, Early childhood education, Education, Favourite reads, Literacy education, Must read, Picture books, Quotes, Writing and tagged Australia, Book, Children, Children's literature, early childhood, education, home education, Language, learning, Literacy, Mem Fox, parenting, parents, Picture books, Reading on April 23, 2014 by Norah. I have always loved reading aloud to an audience, be it my own children, a class of children or, more recently, my grandchildren. I love the opportunity to escape into other characters and other worlds. I love to see the expressions on the children’s faces – anticipation, amusement, trepidation, relief, joy. I love the sounds and rhythms of the language. I love the intricacies of story, poem and information. Reading stories aloud to children provides a great opportunity to establish a connection between author, reader and listener, a platform for sharing ideas, thoughts and dreams, an avenue for discussing ethical questions and implications of choices. These discussions may arise spontaneously and be child-initiated, or they may be pre-determined and teacher-lead as in philosophical discussions and bibliotherapy. Some parents find reading to their children a chore, something tedious that must be squeezed in around the day’s busyness. I am lucky. I never did. Some teachers find it difficult to make time for books in a content-driven classroom; but for me it was always priority. Some parents are delighted when their children start reading for it means the daily read-aloud ritual can cease. I never was. Well, I was delighted that they could read, but we kept on reading together. I read aloud with my children until they were almost teenagers. The books changed, but the joy of reading and sharing never did. During the teenage, and older, years we continued to discuss and share ideas about books we read and recommendations for reading. We still do: some for ourselves and some for the children, my grandchildren. Many of you reading this post take your ability to read and write for granted, as do I. But around the world many children do not have the opportunity to learn literacy skills. According to LitWorld more than 793 million people worldwide remain illiterate. About two-thirds of those are women. Like the people at Lit World, I believe that “the right to read and write belongs to all people”. I was delighted when I read about World Read Aloud Day on Gail Terp’s blog. I have been following Gail’s blog for a little while now. She titles her blog: “The Best Blog for Kids Who Hate to Read”. She says that one of her top goals is to connect children with books they love and her posts provide recommendations of great books to read to and with children, as well as to be read by children. They are easier to follow. They often introduce new vocabulary and expressions. 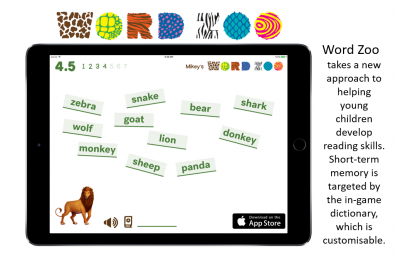 They introduce a variety of writing styles, authors, and illustrators. They provide an excuse to stay close. They provide windows to complex subjects and ideas. Why not join in reading aloud on World Read Aloud Day this Wednesday, March 5. How will you celebrate and share World Read Aloud Day? This entry was posted in Early childhood education, Education, Literacy education, Picture books, Stories and tagged Children's literature, early childhood, education, Family, home education, Language, learning, Literacy, Picture books, Reading on March 3, 2014 by Norah. In a previous post “To school or not to school” I discussed thoughts I had pondered and issues I had considered when deciding the future education of my daughter. Although the main focus of that article was whether to school or not, home education was not only not my first choice, but not even a consideration. 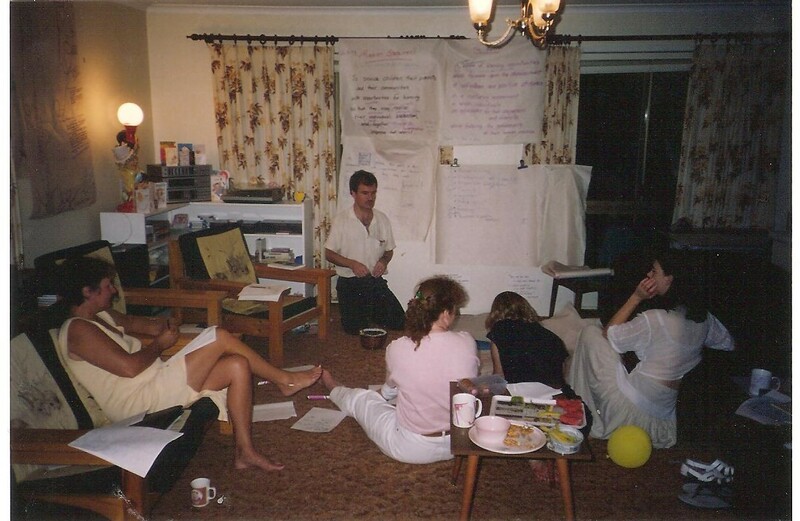 The merest hint of an idea of starting my own school had niggled away in the back of my thoughts for a long time. More than ten years before that article was written, I was in college studying the teaching of literacy when the idea popped into conscious thought. In response to an assigned task, which required that I explain how I would implement a literacy program in a school, I surprised my lecturer (and myself) by explaining how I would do so in a school that I established. Although I was never afraid of placing my own spin upon a set task, I never really expected the idea of establishing a school of my own to be anything more than just that. In the ensuing years prior to the birth of my daughter, my son completed his primary schooling and I taught in a variety of roles, some of which were the most rewarding of my career. During those years I met many other teachers with a similar dream of starting their own school. They were mostly creative and innovative teachers, passionate about their own learning as well as the learning of their students. They inspired their students with an energy that at times seemed infinite. But they felt stymied by the formality and top-down approach of traditional schooling which they, like me, believed to be detrimental to children’s learning and personal growth. Many of these teachers left the profession, unable to conquer the battle between philosophy and practice waging within. Others continue teaching, constantly trying to balance their beliefs about learning and the needs of their students within the confines of the expected formal and didactic approach to teaching. Others have become burnt out, feeling isolated and unsupported, succumbing to the pressure to conform. Few teachers take action to make their dream a reality. Whatever one’s beliefs, it takes a great deal of courage to step outside the norm of accepted practices. To establish an alternative school, in addition to this courage, requirements include a bottomless well of financial resources, an infinite ability to persist under the onslaught of unremitting obstacles, and a firm commitment to ideals and philosophies. When Bec was born the nagging of this idea was so insistent that I was compelled to bring it out from where it was hiding and give it some serious consideration. Without any real understanding of the magnitude of the task ahead, without a well of financial resources, but with a firmly-held belief in what I was undertaking, I set upon the road to turn the dream to reality. 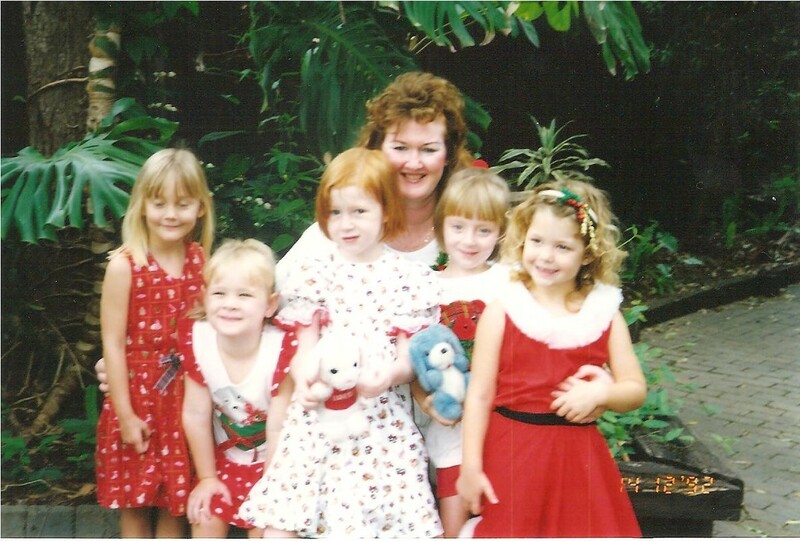 Me with a group of “my” children, including Bec in the middle. 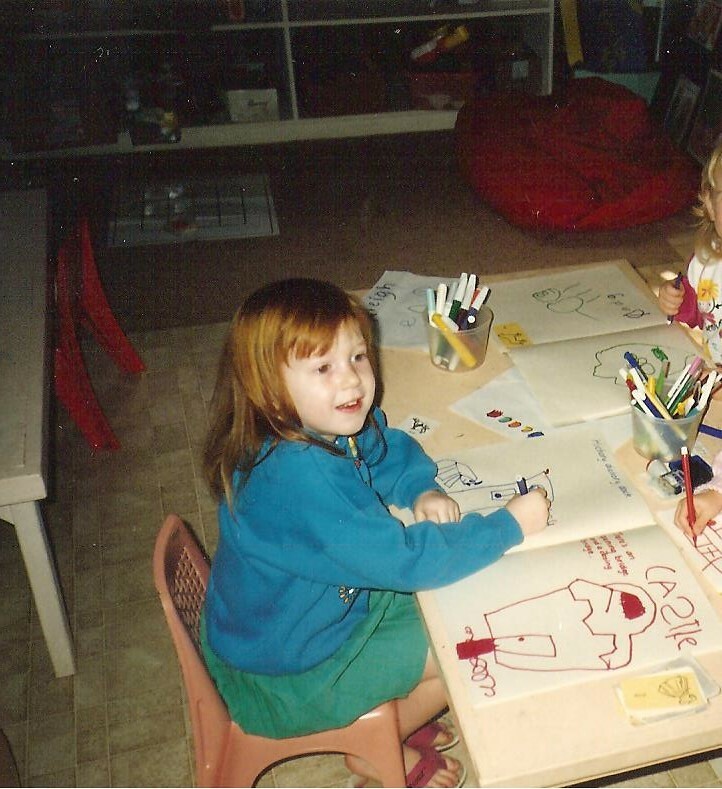 When Bec was about 2, I established a small home-based (but not profitable) business providing educational care for other 2-3 year olds and educational play sessions for parents and children. 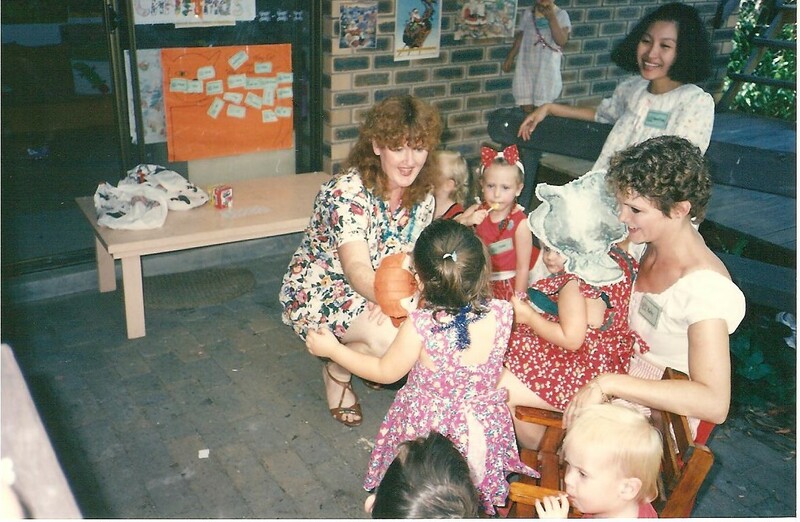 For the children in care, I provided a stimulating learning environment with lots of talk, books and hands-on exploratory activities. I provided support as they learned to have a go and developed confidence in their abilities. In the play sessions I guided parents’ engagement with their children in play, explained how they could develop vocabulary and concepts, and provided suggestions for them to continue at home. Even after 20 years, parents still tell me how valuable those session were to their children’s education. At the same time I investigated and explored alternatives to traditionally schooling available in my area but was disappointed that none exactly met my criteria. Some were too laissez faire, others followed pedagogical approaches I believed to be unsupportive of children’s learning, and others were based on philosophies I didn’t agree with. I began constructing a vision of what my ideal school would be. I invited other like-minded teachers to join me and we got to work on building a team, enlisting families, and seeking out a facility. Approval by the education department was easily achieved and interest of parents was forthcoming. In the end, the greatest stumbling block and final inhibitor of the project was town planning. 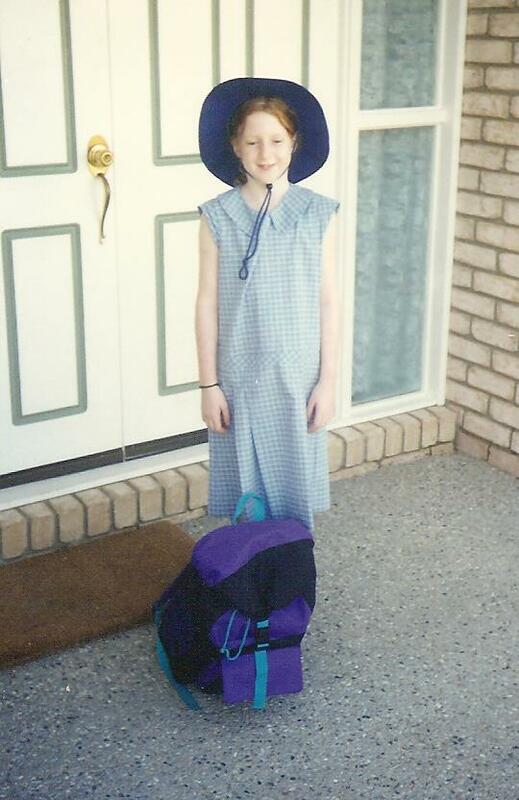 Throughout those establishment years Bec was not enrolled in a school. She was educated at home while we waited for my alternative school to open. We participated in some home schooling group activities, and I continued to conduct home-based educational sessions for Bec and other children. After about 5 years and two aborted starts, the project was terminated and Bec’s home education came to an end. Well, it really didn’t come to an end. She continued to do a lot of learning at home, but as she was enrolled in the local government school, it was her official education provider. I often wonder what our lives would be like now if my dream of opening an alternative school had been achieved. I do believe I gave the dream my best shot, but after a long time and many false starts, I decided that perhaps I should listen to the messages. With most families, like ourselves, more interested in an alternative school than in home schooling, it was time to let it go. Other families, like me, were not enamoured with the local offerings, but then, also like me, had to decide the future of their children’s education. I no longer felt comfortable asking families to stay committed to the goal with no tangible start date in sight, and after a final search for a suitable property hit another dead end, the idea was abandoned. I was not committed to home education as a long-term alternative for Bec’s education, and so finally, in year 4, she started school. This entry was posted in Alternative / non-traditional education, Early childhood education, Education and tagged alternative, creative, dream, educational play sessions, home education, ideals, innovative, learning, philosophy, play, teachers, town planning, traditional schooling on September 8, 2013 by Norah. 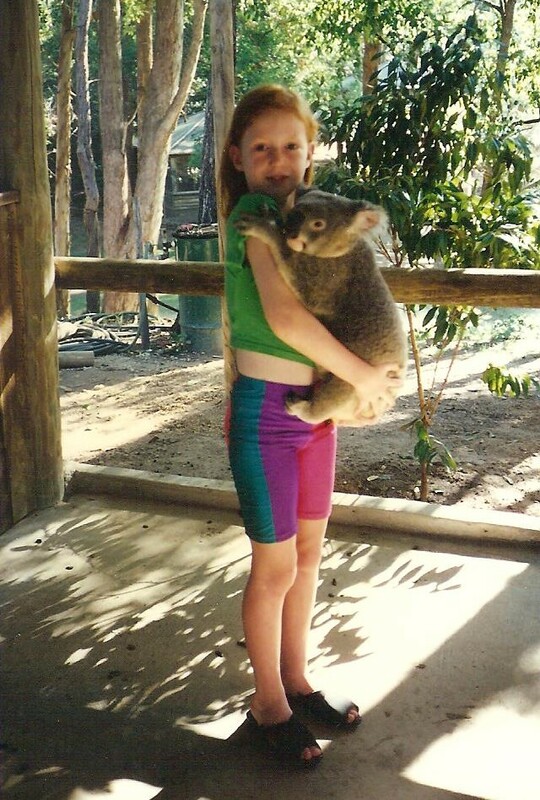 My daughter, Bec, now 26 and working towards a PhD in Environmental Management at UQ, has beaten me to the post by writing the following reflections on her schooling experiences. Who better to explore the effects upon her education than she herself? 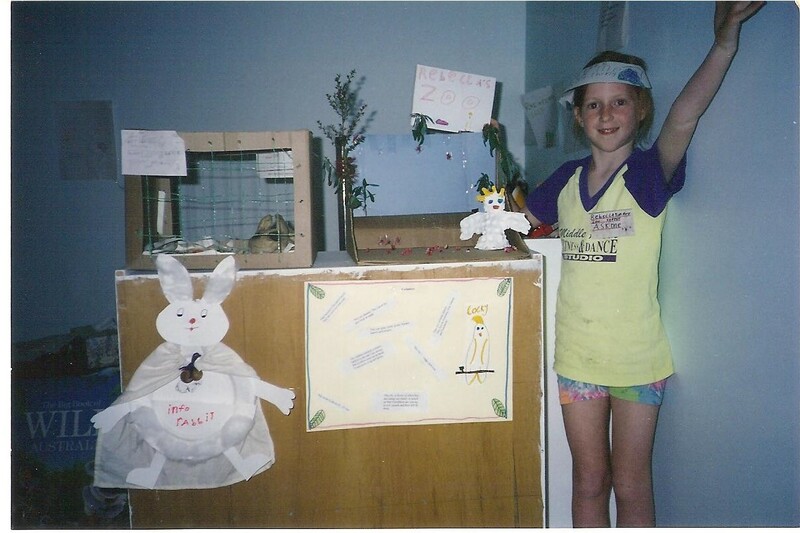 I also remember that when most other children were in school, I got to play with clay at home, and used the clay to create ‘exhibits’ for a zoo about my favourite animal. It was a great motivation to find out as much as I could about the animal, and I immersed myself in it. I started with rabbits (which I still love though have a real ethical struggle with given they’re such a disastrous environmental pest here in Australia) and then moved onto the Sulphur Crested Cockatoo. Another memory, from my very long childhood, was that when most other children were in school, I set up at home ‘The Rainforest Club’, where I made a desk, a rainforest-related library, and a membership program. What was the point of the club? Who knows – but the evidence is still present in a number of Norah’s books which include markings on the inner cover to the effect of ‘This belongs to the library of the Rainforest Club’. I remember frequent trips to the Sciencentre when it was in its old digs on the other side of the river, and a day starting with picking strawberries at a local farm, then bringing them home to mix into home-made strawberry ice cream. 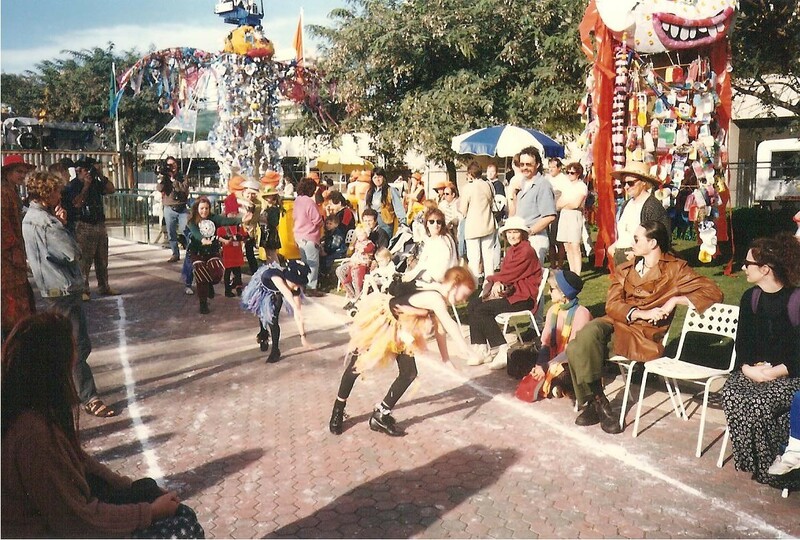 I also remember being very proud of myself when I got to cartwheel in a parade at the ‘Out of the Box’ celebration at Southbank. Then there was the day when an intimidatingly large cane toad launched toward me when I was sitting at the front of a group of children watching an engaging talk about animals (unlike the bunny rabbit, I am not quite so much torn between heart and mind about this invasive species, although increasingly it seems that the story of the cane toad in Australia reflects the story of post-1788 colonisation in Australia). A less traumatic animal experience was going on the ‘Batty Cruise’ down the Brisbane River as the macro bat colonies were stirring shortly after sunset. It was absolutely incredible – there were thousands of bats flying overhead – and an expert on board had a baby bat AND a baby echidna. I also know Norah still has the story I wrote which explained all of the mysteries of neuroscience; “How the Brain Works”. Obviously, it’s a little man who lives in my brain, working efficiently with a series of filing cabinets. What this little man didn’t work out at the time though – and only really worked through the files to figure out years later – was that despite not being at the time in School with a capital S, I was in school during every moment of the day and night during those early years. I LOVED visiting the library and the museum and the Sciencentre. 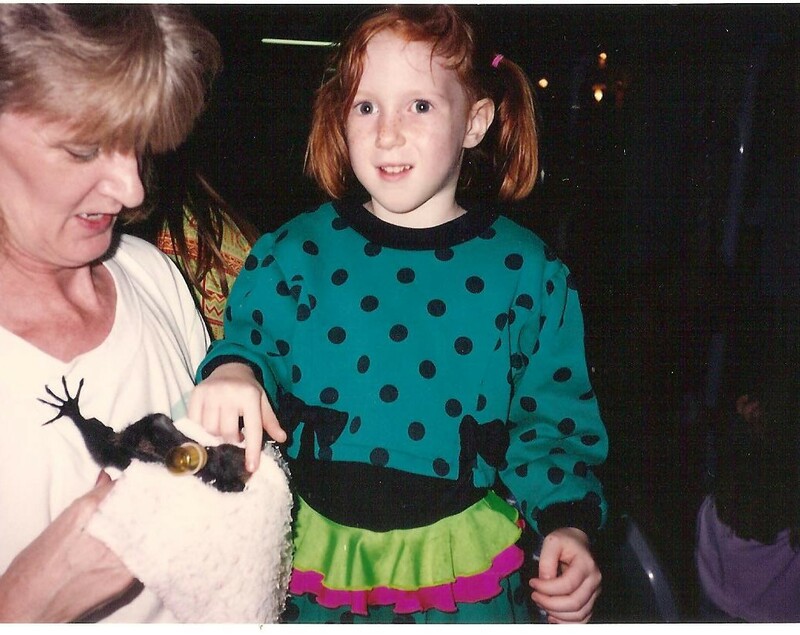 I LOVED reading books, researching about animals, writing stories and experiencing my world. There’s no evidence in my memories that I was ever actively Being Schooled – I remember playing, spending time with my mother, going on fun day trips, and being creative. All of this, as far as I knew, without a formal lesson plan presented to me in the morning, without worksheets to complete (though I did spend a lot of time writing for fun – can you imagine such a thing? ), without testing which would give me a reductive and quantitative measure of my intellect, abilities, and ranking against other children. I started School with a capital S in grade 4, which was very hard to begin with. The decisions which led to my enrolment in a School are absent from my memories of the time, but I think I remember that I wanted to be with other children. It makes me sad to think back on this, because I worry that as a child knowing nothing but my own life as the basis for all of my understandings about the world, that perhaps I didn’t appreciate Norah enough, and maybe I hurt her feelings when I wanted to be with other children. When I started School, I have a vivid and poignant memory on the first or second day being given a worksheet with no idea about how to complete it, as it was such a foreign concept. 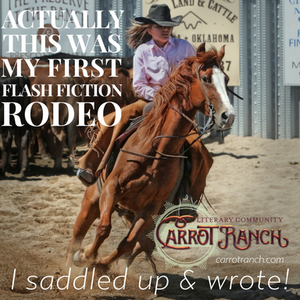 I felt out of my depth and incapable of fitting in, and I was upset. It took a little while to make friends (which resulted in a number of lonely lunch breaks), but once I did I was happy. I enjoyed most of the school work, and as far as I am aware my schooling experience from that point on was no more extraordinary than that of any other child at a state School. I missed being with Norah during the day but I was lucky that she was involved as a parent helper in my class, and then had a teaching position at my School. I would like to offer some evidence of the impact that being home educated has had on my life, but I am not sure how to do this, after all, I’m the experiment and there’s no control for comparison. 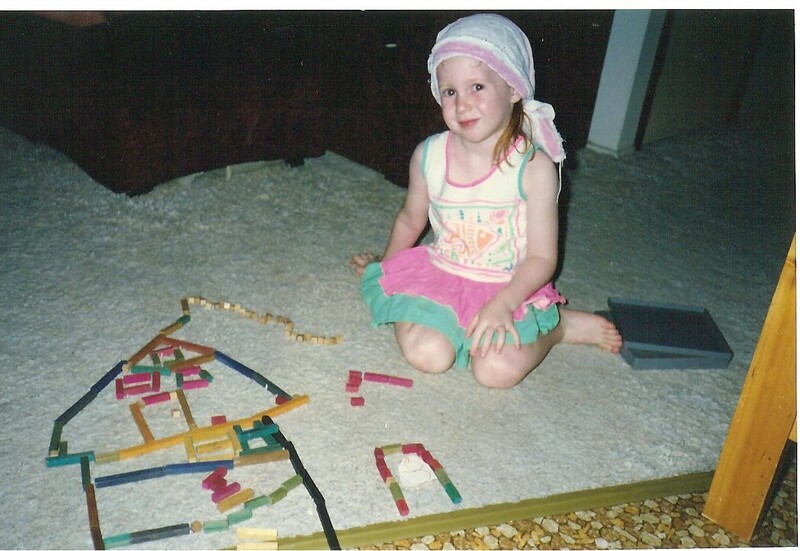 I can, however, say that I loved my childhood and I still have a very strong and driving love of learning. These early photos portray activities that continue to interest Bec to this day: a love of animals and nature, an enjoyment in cooking and sewing, creative crafts, mathematics and writing. This entry was posted in Alternative / non-traditional education, Early childhood education, Education and tagged education, home education, learning, schooling, thoughts and ideas on August 28, 2013 by Norah.